Translated by Peter Paul Seaton Jr. While the recent revival of interest in Constant’s thought has been welcome and fruitful, it has been incomplete, tending to leave out of account his writings on religion. 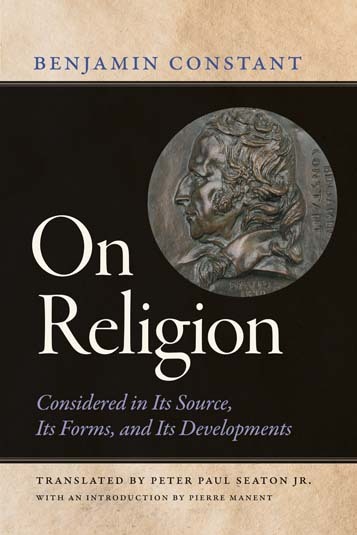 In this connection, On Religion is essential reading and of interest for many reasons. As an analysis of humanity’s religious experience, the work is notable for its methodology. Unlike previous writers with dogmatic commitments, whether theological or philosophical, Constant aimed to work with well-established facts and to relate religious forms to their historical contexts and civilizational developments. In this way, he was a precursor of the scientific study of religion. This objectivity, however, was not tantamount to moral-political neutrality. In the aftermath of the French Revolution, he wanted partisans of the new order to recognize that the religious impulse was natural to the human heart: to extirpate religion was therefore a fool’s errand and worse. Likewise, he instructed religious reactionaries that history had left them behind: now the natural state of the religious sentiment was an unfettered “spirituality” left free to find new forms of expression. His counsel to contemporaries has proven prescient concerning subsequent religious developments in democratic and totalitarian societies. In his day, Constant was a consistent liberal, a life-long advocate of representative government, as well as of the central liberal arrangement concerning religion: separation of church and state. But On Religion demonstrates that principled liberalism can turn a sympathetic as well as analytic eye toward religion and, in an unbegrudging way, find an important place for it in free society. There are signs that this is a lesson that contemporary liberalism would do well to relearn. Peter Paul Seaton Jr. teaches philosophy at St. Mary’s Seminary and University in Baltimore. His scholarly interests focus on the intersection of religion, politics, and philosophy. He has translated a number of works in French thought, especially political philosophy. These include works by Pierre Manent, Democracy without Nations? and Modern Liberty and Its Discontents (with Daniel J. Mahoney), Chantal Delsol, Unjust Justice, and Rémi Brague, On the God of the Christians and The Legitimacy of the Human.